wav files should be easily readable on a mac. just use the wav export feature of the 2480 to burn them to disc and import them onto your mac from the cd. I have had no problem with the wave files other than when loading to the mac program it is a read only file and will not allow me to save in the mac program. Is there a way to copy rather than read only? There must be something else going on that I don't understand. Is it possible that you are not fully copying the .wav files from your CD, but are instead only creating links to the CD files? I use Sound Forge on a PC to actually extract CD tracks to the computer hard drive to avoid this problem. Maybe your problem is similar?... Or maybe someone else will have a better insight and answer for you. Thanks for your input, will try again. I am using Presonus Studio one on my mac. I will look a little closer to the wave import procedure in Studio one. From the Roland I used the track export in the mastering room drop menu on my 2480cd . When I import the wave files to the mac I can work on the song tracks only with the cd wave files actually running. Studio one saves all the mixing and effects settings with out the data. Will post the results after I try again. Hello everyone, I hear ppl say burn to CD then to input to PC (Mac or PC). Is there another way to do this process, like, if a usb connector with a midi in/out on the other in to be use instead of burning to a CD? The idea is to get VS backups to the PC, so only methods that create VS backup format is useable... that means, backup CD, backup to CF or SD card through the proper SCSI adapter set-up, or VirDis direct to PC. There is no way to output and create VS backups through a midi connection that I am aware of. Midi in the VS world is used for control messages and operating system updates. can`t connect to the goodlibrary.com.website down? This link that I keep bookmarked still works for me. I can't seem to get there from a google search howeveer. It's been a long time since I've been on this forum. This Export tool is exactly what I've been looking for. My CD drive is F. I created a desktop folder named "Rip Folder" and put the path to that folder in the quotes in the 'command line'. When I hit the any-key I get an error message "No created song folders found"
VS2480DVD,3-VS8F-2/1-VS8F-3 & 5 plugins+Auto-Tune,MassHiRes EQ,UA Bundle,Chrometone,Soundblender/TC Reverb,T-Racks.Dyns BM5A's,Roland DS50A's,M-Audio 2.1,PreSonus TubePre w/Rode NT1000,SM57&58,MXL V57&V67,B-5,XV5050,Yamaha P200,Oxygen8 V2,Behring V-amps,SansAmp DI, Taylor,Gibsons,Fender,Ric,Washburn Bass.2 RPC-1's,PC Sonar 4, Acid 5, Wavelab etc. I may have mentioned this before, but it seems to be that there is a problem with creating a destination folder to your desktop. Try creating a folder on your drive that isn't stored in the desktop folder. Hmmmm, well I just confirmed to myself that the Ripper will indeed rip a backup to a desktop folder, at least when operated through VSWaveExport. Also, VSWE exports .wav files to the desktop as well. I created a folder directly on the C drive, and used that as a destination folder. I used that path in the "Export to" and command line places and got the same messages. I then created folders with the song names in the destination file and still got the same error message. Checking further on my own system..
You won't get the "any-key" followed by "No created song folders found" messages unless something was wrong that stopped the ripper from doing its job. something like "Drive Type Is Recognized As CDROM/DVD", or to that affect and then follow with something like what you see in the image below, plus you should see it indicate a bunch of "Takes" in the list it generates. It will still ask you to press any key when finished, but won't give you the error message in return. Is it possible that your VS Songs were not recorded in one of the supported recording modes? I know that the ripper does not support LIV mode, for one. The songs were archived as a Backup CD. Here is a screenshot of the window that I get. I just now noticed what it was actually saying. EDIT: How do you get a JPG to post? Ever consider a Wave Packing utility? I do not see any email from you MJL.. are you sure you got the addy correct? It's a tough problem on a couple of levels. First getting it back into RDAC, then altering the eventlist file to put it on the timeline. Given that you can use wav import on the 2480, probably just going to have to leave it at that. Still do not see any email from you ... my profile has correct email so I do not know what to tell you. The message you are seeing means the cd2roland.exe file is not being found. It must be in the same directory as the Vs Wave Export.exe file (and the ExeStub.exe and the RDAC.dll files). All these should extract from the .zip file. My antivirus program, Avast Free, was seeing the dc2roland.exe file as malware and putting it in their virus chest. I'll have to get that issue resolve. To file a false positive report they are asking for: Program Name, Program Publisher, Program Version. For the "program name" do I Just use the cd2roland.exe? What about publisher and version? I turned of my virus sheilds and the program ran. and extracted to VRI files. I'll deal with that in the morning. It would be soooo sweeeeeet if I could get this wonderful program to work. thank you for you help. I still don't know what happened to the email. Ok, My ignorance is amazing. Do I have to purchase VirDIS software? Or Hardware? if so, Where do I get it? A few others have reported the virus warning - I do not know what is going on with that - I do not have control over what is on the download site. If you can get a email to me, I will answer it with a version of CD2ROLAND.EXE attached I KNOW is totally clean. You need to enter the CD2Roland.exe as an "exception" with your Antivirus if possible. In my post above I stated that I tried to do that but that I needed specific information in order for the report to go through. 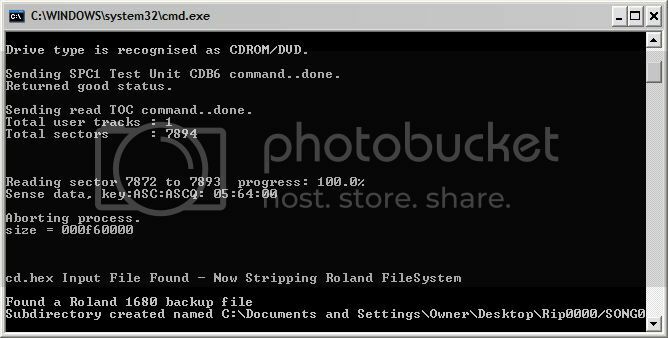 "Program Name (cd2roland.exe) Program Publisher ( ? ) Program Version ( ? )" bear, I've tried to send another email. I have no idea what going on with that, either. How do I convert the VR1 files to WAV files? VSWE should show you the song title in its list box after the song is ripped (assuming you're using VSWE to do all this. Highlight the song of choice and VSWE should show you which tracks and virtual tracks data can be found in the matrix next to the list. Click on each track that contains data you wish to extract/convert to a .wav file, or choose all tracks. Be sure to indicate a destination for the extracted .wav files in the Export To field. You should then see VSWE extract files and indicate how many when finished. Then, simply look in the destination folder to find the .wav files. Hope that helps. I'm not at a machine where I can check all the steps at the moment. bear. thank you for the "clean" file. I got everything working and I'm ending up with .WAV files. This is SO COOL! Thank You once again. Weird... I've never had a problem with downloading "unclean" VSWE files... They've always been fine. I don't know... there is certainly no virus in the program put there by me... my version on my machine checks clean on every check I do online. I'm pretty sure it must be false positives in Avast.... that seemes to be a common denominator, IIRC. Hey guys! I've tried a project backup...I get all the way to the part where I'm supposed to drag and drop the SONG.VR1 file into the vswaveexport window...when I go to drop it it just shows a circle with a line through it...it won't let me drop the SONG.VR1 file there...what can be the cause??? I have a new client who insists on doing his editing on pro-tools but records live with a VS2480 - will the VirDIS make this possible? Be gentle - it's my first time! Generated in 0.032 seconds in which 0.017 seconds were spent on a total of 13 queries. Zlib compression disabled.